State lawmakers might ban the use of Native American mascots in public schools. Massachusetts lawmakers are weighing whether to ban the use of Native American mascots in public schools — a proposal that drew strong opinions at a public hearing Tuesday in Boston. The push comes after the town of Tewksbury rebuffed efforts to change the name of its high school mascot, the Redmen. State Rep. James Miceli, a Democrat who represents Tewksbury, said opinion in the town was overwhelmingly against changing the Redmen mascot. He urged fellow lawmakers to reject the bill outright or exempt communities that already have voted, as Tewksbury did at a town meeting. ‘‘The Indians have been to that community many times,’’ Miceli said after testifying. ‘‘We held powwows in that town. Never once when I have seen this did they mention anything in opposition’’ to the mascot. There are even divisions among Native Americans. Gloria Colon, outreach coordinator for the North American Indian Center of Boston, said she is troubled about the way some mascots are portrayed. ‘‘Some of them depict large noses and some of them seem to be angry, so that’s very offensive to me,’’ said Colon, of Micmac heritage. But Gene Weeden Williams, a Narragansett Indian who lives in Amesbury, saw nothing to be gained by going after Native American mascots. Democratic Senate President Stan Rosenberg said he has heard mixed messages from residents. In 2015, California’s governor, Jerry Brown, signed legislation making the state the first to bar public schools from using the Redskins name for sports teams. In Oregon, school districts with tribal mascots must do away with them by July 1. The state makes exceptions for districts that get the approval of one of Oregon’s nine tribes. In Wisconsin, opponents of Native American mascots can file a complaint. In 1993, the Washington State Board of Education passed a resolution encouraging schools to drop Native American mascots. Some Massachusetts school districts have taken similar action. In 1988, Wellesley dropped the word ‘‘red’’ from its Red Raiders nickname and adopted a pirate mascot. Since then, Frontier Regional School in Deefield changed its name from Redskins to Red Hawks. Natick switched from Redmen to Red Hawks. 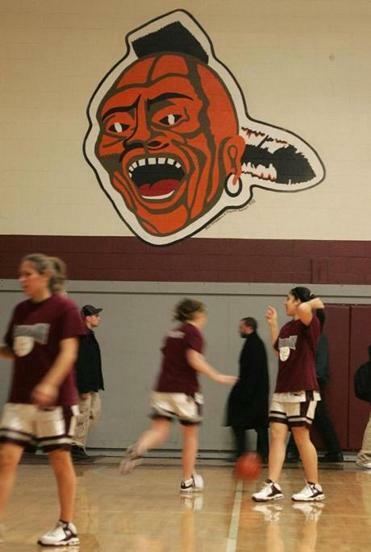 And the Gill-Montague Regional School Committee dropped Indians as the mascot for Turners Falls High School. The controversy has also embroiled professional sports teams, notably the NFL’s Washington Redskins and the Cleveland Indians of Major League Baseball. In 2014, the US Patent and Trademark office declined to register several trademarks for the Redskins, a franchise that was founded in Boston in the 1930s, citing federal regulations against protecting words and images that are disparaging or offensive. The team argued the rule violates the First Amendment.